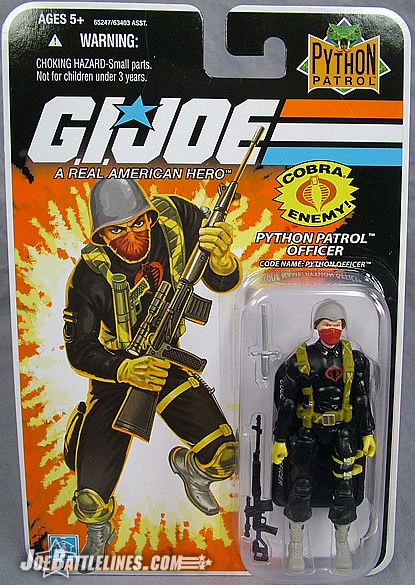 I can hear it now— someone reading this review will state “He’s not a real Joe fan!” The reason for this exclamation is that I’m about to admit that I own exactly ZERO ARAH-era Python Patrol figures. 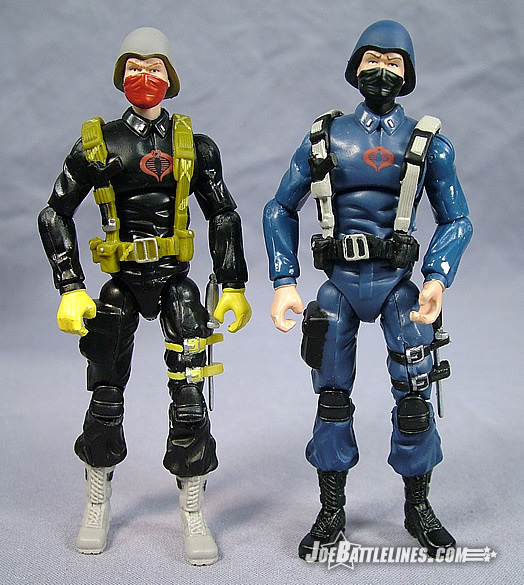 This particular sub-team of Cobra debuted around the time that I was growing “too old for Joe” and so they fell off of my radar. 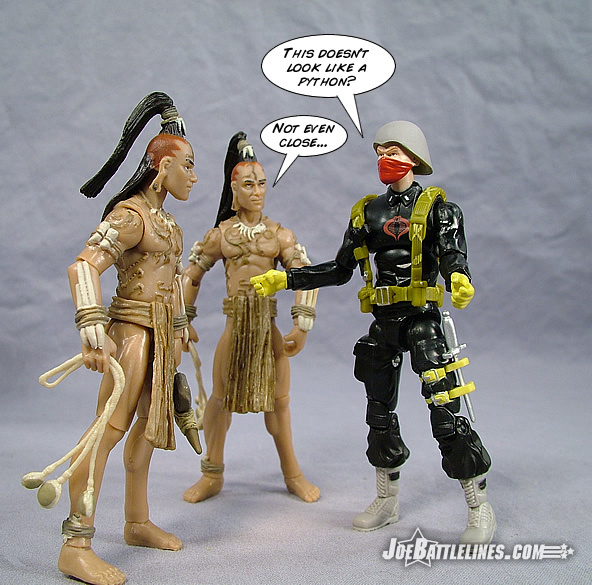 Years later when I re-discovered GIJoe and hopped on this “new fangled internet”, I never sought out any of the vintage members of this team because I found their color schemes to be more than a bit impractical. (I much prefer the VvV-era Python Patrol color scheme found on both the TRU six-pack and the Viper/Tele-viper two pack.) 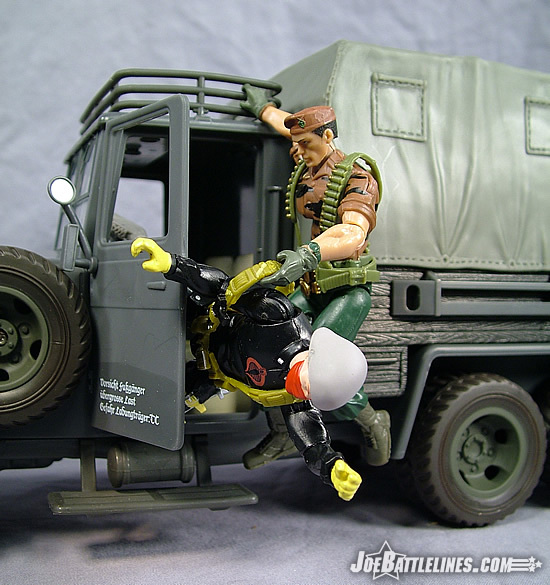 With the penchant for mold reuse and repainting that Hasbro had demonstrated in the eight years since GIJoe returned to store shelves, it seemed inevitable that the “classic” Python Patrol would once again return to store shelves. At first glance this figure, like so many other recent releases from Hasbro, seems uncannily familiar. The Python Patrol officer is based 100% on the body of the 25A Cobra Trooper that has seen numerous releases in the past year. 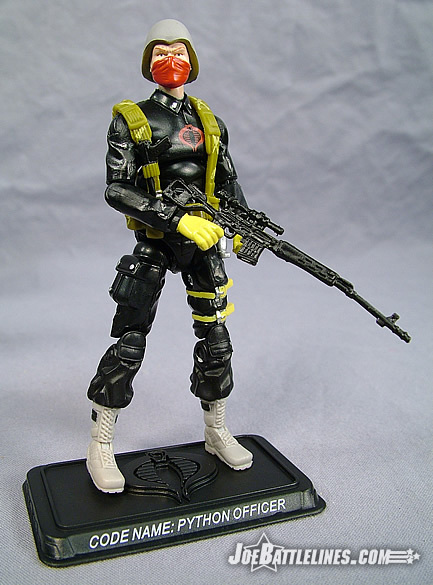 While the reuse of the Cobra Trooper web gear and helmet might seem a bit perplexing it is in keeping with the 1989 debut of the character which used the body of the ARAH-era Cobra Trooper. (Apparently the Python Patrol is where Cobra plays “opposites day” and has the officers wear trooper gear and the troopers wear officer gear. No wonder these guys never seem to win a battle!) The uniform is now a basic black instead of blue, with light gray boots and helmet. 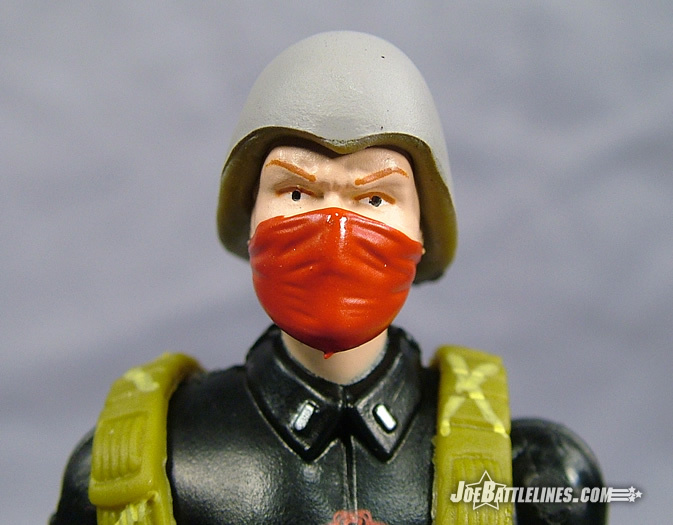 The mouth scarf is rendered in the same bright red as the prominent Cobra sigil found on the Officer’s chest, and the gloves and knife sheath are painted a particularly bright yellow. (Yes, you read that correctly.) The figure’s included web gear is molded in a dark yellow-green hue with some yellow cross hatching done to simulate the “pythonizing process”. I’m going to be perfectly blunt here. I look at this figure and wonder when the ARBCO Brothers Circus rolled into town. While it’s a pretty accurate update to the classic color scheme with only the kneepads missing their “scaly color scheme” it’s also one of the most ridiculous combinations of color I’ve seen. (Only the Python Crimson Guard and the Trooper fare worse under this scheme.) So while it’s a great nostalgic nod to a figure who debuted just shy of 20 years ago, it’s also a resurrection of a color combination that quite honestly never should have seen the day in 1989. I applaud the design team for finding new and interesting ways to keep re-releasing the blueshirt mold but this is one that I feel is going to hold extremely limited appeal. Nostalgia fans of the late 80’s will want to purchase this figure but I can’t see a new Joe fan walking up to the pegs at his or her local retailer and exclaiming: “Wow! These guys ROCK! I’ve got to get at least 20 of them! !” Perhaps Justin has something far more insightful and constructive to say but I’m done. All that out of the way, as I said I was no fan of Python Patrol back in the day. The concept was fantastic, with uniform and paint that makes troopers and vehicles invisible from radar. What a great idea! 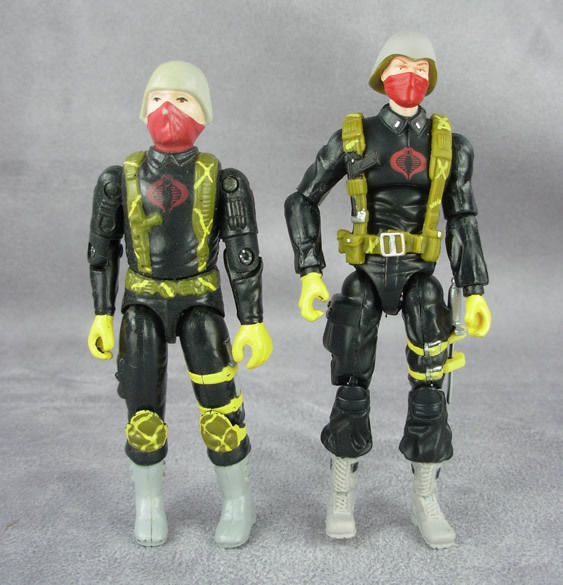 Unfortunately back in the late 80’s, the Python Patrol concept was as far as the coolness went and we got saddled with bright green, yellow and gray figures that did not seem to portray “covert ops” or anything of the sort. I absolutely loved the color scheme of the vehicles, and of the Toys “R” Us 5-Pack we got back a few years ago, but the classic Python Patrol colors just never did anything for me. However, if Hasbro were going to choose one particular figure to do a Python Patrol repaint of, this one would get my vote, simply because at least there’s a ton of black throughout the uniform. Yeah, there’s the yellow gloves and the trademark green/yellow uniform straps, but for the most part the black and gray isn’t quite so bad as some of the others. Like Fred, I don’t see much to recommend here, but that’s mostly because I’m not really a Python Patrol fan…for those folks who like that team and those figures, this will be a welcome addition, but to me, I don’t have much use for it from a personal perspective. I don’t mind neon on figures that are well suited for it. In the Battle Corps line certain figures were successful in SPITE of neon, but I would never actively campaign for overly bright color schemes. However, in my opinion the Python Patrol figures just were not well-suited for the bright colors and didn’t really fit. That opinion still stands today. This figure is fine for the Python Patrol fans, but I’m not one of them, so it doesn’t really impress me a whole lot, and I can’t recommend this figure fully. Make up your own mind as always, but from my perspective this one I have for my collection is the only one I’ll be owning.